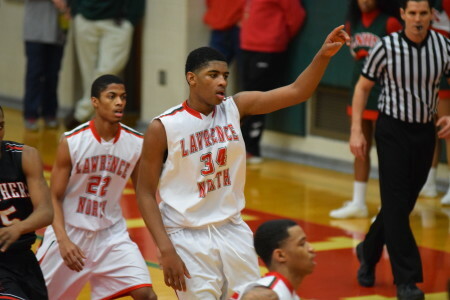 *Here's a name to watch: Lawrence North freshman-to-be Kevin Easley. The 6-5 Easley, who played up an age group with his George Hill Rising Stars team last weekend at the Adidas Invitational, has interest from Indiana, Purdue, IUPUI, IPFW, Butler, Illinois, Temple and Saint Louis. 2018 hasn't actually had any rankings put out yet, but Easley, from all accounts, could be the early leader as the #1 player in that class. Butler watched him at Fort Wayne last weekend. Easley is from Indianapolis. Lawrence North HS. 6'6 210 lbs already entering his FR year in HS. Butler and IUPUI represented here at the Lawrence North-Lawrence Central game. Is there anyone else we're keeping an eye on on either of those teams? (Sorry if I should know the answer to that.) Or may we still be keeping tabs on Kyle Guy? 2018 forward Kevin Easley had a strong showing for Lawrence North last night with 10 points and 5 rebounds. As others have noted Kevin Easley(2018) was at the game yesterday. Rankings haven't dropped yet for 2018 kids, but already heard some rumors that Easley will be a 5 star. He's 6'5. LN is having a good year. Looking forward to seeing him in Feb in a game that I plan to go to. I haven't seen him play yet, as I rarely if ever watch the 8th and 9th graders in AAU. Freshman Kevin Easley off the glass to put Lawrence North ahead 60-57. North Central ball with 54.7 seconds left. Kevin Easley scored 28 against #3 Southport. I'm so ticked at myself because I was planning on going to that game and decided last minute not to go. I went. He was the best player on the floor last night. For a Freshmen he is confident, not cocky, smooth, doesn't rush things. Has a nice J. Very smart player that plays within himself. He has a REALLY nice game temperment. I've heard rumors that when the 2018 rankings come out that he could be a 5 star and a couple people said he MIGHT be ranked #1 in his class. Easley is definitely a 5 star. I haven't seen any of the freshman class really, but there can't be more than 20 or so players better than him in the nation. Wouldn't be surprised if there isn't 10 better. He didn't get a ton of touches in this one but he looks like a future pro. No doubt. Great skills. Great size. Cal is gonna be all over him. Tom Crean, Matt Painter expected to watch 2017 F Kris Wilkes (North Central) vs. 2018 F Kevin Easley Jr. (Lawrence North) tonight. Kevin Easley update from Kyle. @Section_29: Heard Terry Johnson was watching Lawrence North (Easley and Cushingberry) tonight.